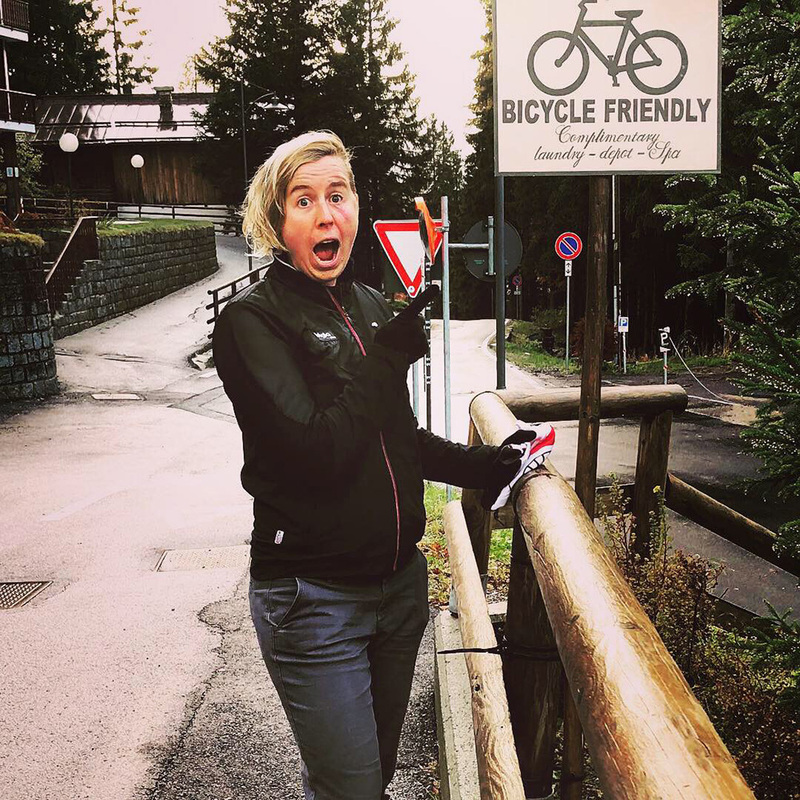 I have been working like a maniac and nonstop since I arrived in Italy for my bike touring job at the end of August. However, I am feeling good and recovering well and happy to move forward for next year in training. I am starting to really look forward to getting in some hard solid winter training now and especially being in Tucson will be amazing!! I can’t wait to get back into my regular training regime. On another note, I’ve recorded some observations during my time in Italy about my nutrition and vitamins. “Now that I am in my moment of break and I’ve been working constantly for about a month, I must stay that I have also not been taking vitamins for a couple weeks and I can definitely feel the difference. Especially in my diet when I am not eating as healthy (as I do when training) or being as consistent with consuming vegetables. 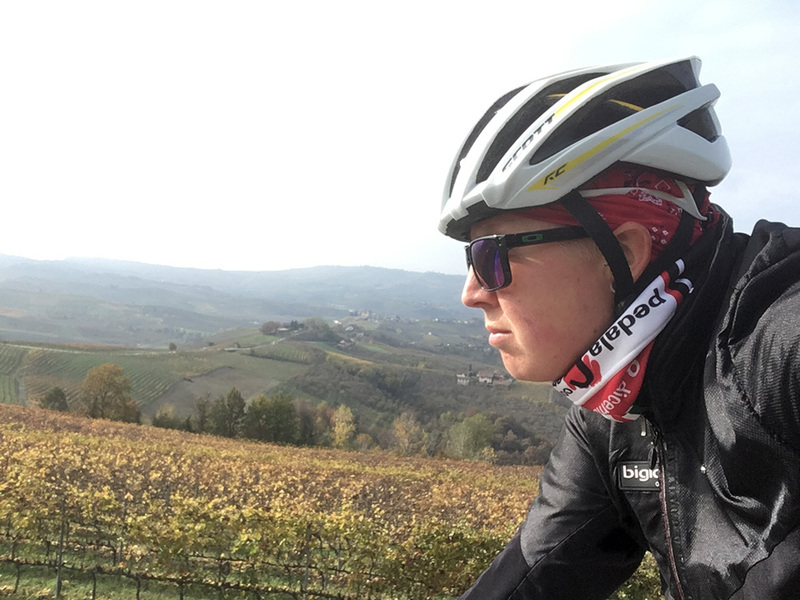 I notice a lack of energy when I am working and lack of intensity on the bike when I’m riding. 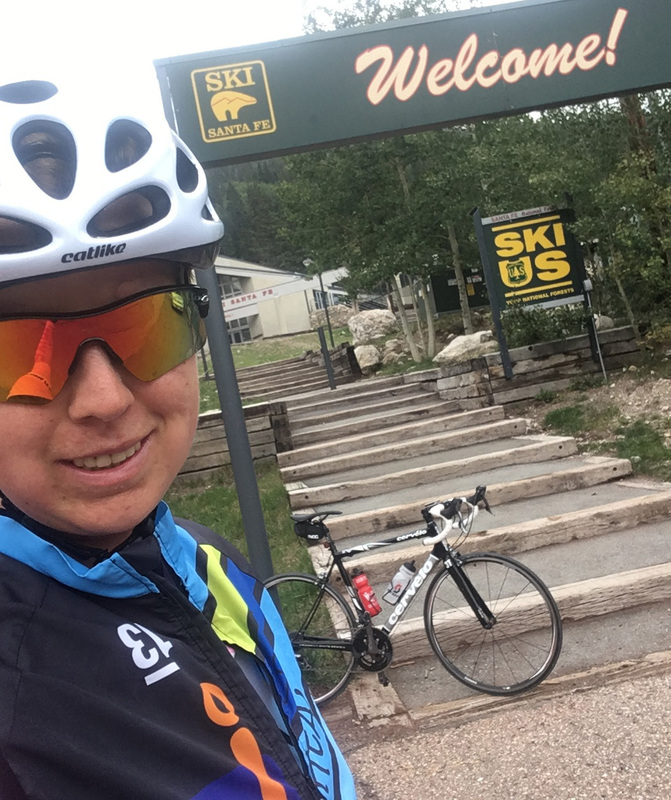 This is fine for now, and a good test for me as during this time I do not need a high-intensity effort while riding and it is a good test of my energy levels to see the contrast while I’m working compared to training. “Boy do I feel the difference! Since I have been regularly taking supplements again I can feel my energy going up and my willingness to push more and have more intensity on the bike. I feel the difference in my regular diet as well as I feel more motivated to eat healthy. This is a big contrast and difference I can see from the period when I was taking supplements to when I stopped and now again to taking them. This shows how big the influence of nutritional supplementation is for my body. I will continue taking my vitamins and being active while working and also eating a healthy diet to maintain my energy levels and physical ability. I am so busy while working that supplements are often hard to take while changing hotels or setting things up for the day. But if I have my vitamin bag and make sure to keep it somewhere easily accessible, then I am more willing to take them and can easily. It is great to be working so closely with an amazing company like Health Products Distributors, Inc. where I can do this sort of test to see the differences. It shows a huge difference in their products compared to just food and how they affect my body. I have been taking Mighty Multi-Vite!, Ultimate Protector, Essential Fats Plus E, and Myo-Mag. Editor’s notes: Irena primarily takes HPDI Foundational Supplements which are the base or core of a nutritional supplement program. 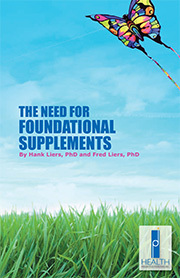 Foundational supplements include a high-potency multivitamin (Hank & Brian’s Mighty Multi-Vite!™), vitamin C/antioxidant formulas (Ultimate Protector Nrf2 activator formula), essential fats (Essential Fats Plus E), and Rejuvenate! high-RNA superfoods (Rejuvenate! Original Greens, Rejuvenate! PLUS, and Rejuvenate! Berries & Herbs). She also takes other HPDI formulas like Myo-Mag (magnesium formula), pH Adjust alkalinizing formula, Warrior Mist (topical pain reliever), and other formulas depending on her needs. Omega-3 essential fatty acids (EFA) are critically important for health. That is the reason we at HPDI include them in our foundational supplements system in the form of our Essential Fats Plus E formula. Essential Fats Plus E provides a balanced ratio of 4:1 omega-3 EPA to omega-6 GLA fatty acids proven to optimally support health. As important as Omega-3 fats are in good health, various studies conclude they are of little value. In order to help clarity the fallacies found in such studies, this month we re-print the recent article “Omega 3 Fatty Acids and Cardiovascular Disease” from the Orthomolecular News Service (OMNS). Essential fats including Omega-3 and Omega-6 are so important to health that we consider them as foundational or “core” to basic nutrition as multivitamins, antioxidants/vitamin C formulas, and high-RNA superfoods, like Rejuvenate! Plus. Many of today’s health problems relate to deficiencies in Omega-3 essential fatty acids rather than overabundance of it. It makes sense for everyone to supplement their diets with at least a minimum amount of essential fats. This is addition to consuming foods high in Omega-3 (and Omega-6) essential fats, including leafy greens, nuts, seeds, and seed oils. Also, small amounts of wild-caught fish from clean waters. Preferably these fish would come from low on the food chain, such as sardines, herring, or young mackerel, for example. In December 2107, my father Hank Liers, PhD, wrote “The Truth about Essential Fatty Acids.” In his article, he delves into detail about why essential fatty acids are critical for health. 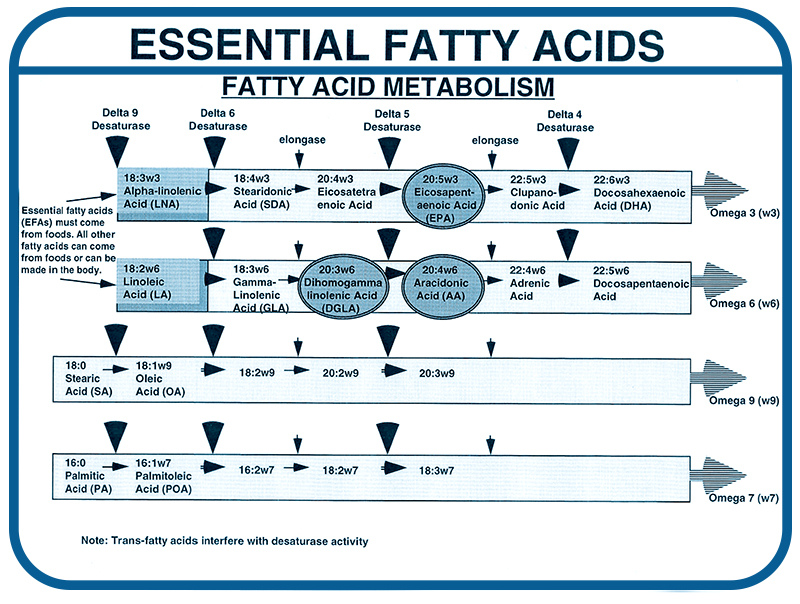 The diagram below from Dr. Hank’s article shows in detail the pathways for the production and use of fatty acids in the body. In the figure the metabolic pathways (running left to right) for four fatty acids types are shown (top – Omega-3, second – Omega-6, third – Omega-9, bottom – Omega-7). Notice that only the omega-3 and omega-6 oils are considered to be essential fatty acids because they cannot be made in the body. This means they must come from food. Furthermore, an additional diagram from Dr. Hank’s article shown below provides details of the omega-6 and omega-3 pathways. Pathway specifics indicate key eicosanoids (series 1 prostaglandins [anti-inflammatory], series 2 prostaglandins [pro-inflammatory], and series 3 prostaglandins [anti-inflammatory]), oil sources, and important nutrient cofactors that are needed for the reactions to take place. In particular, Dr. Hank discusses how superior benefits to health result from a balanced 4:1 ratio between Omega-3 eicosapentanoic acid (EPA) fatty acids and Omega-6 gamma linoleic acid (GLA). 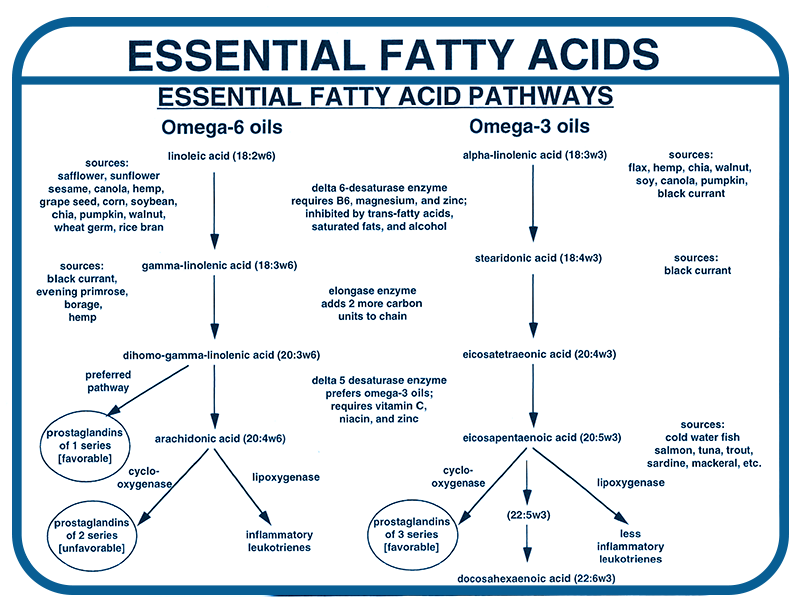 Below we list some of the functions and benefits obtained when by diet or supplementation the correct ratios and amounts of essential fatty acids are consumed. Dr. Hank also discusses the fallacy of thinking that supplemental Omega-3 fats alone are sufficient to produce health. That is, despite the relative lack of Omega-3 essential fats and the prevalence of Omega-6 fats in modern diets, it is nevertheless the forms (EPA and GLA)—and the critical 4:1 ratio between them—that makes the difference in how they act synergistically for health. The result of Hank’s scientific understanding of essential fatty acids has resulted in his formulation of a balanced EFA product, Essential Fats Plus E.
Regarding the Orthomolecular Medicine News Service article “Omega 3 Fatty Acids and Cardiovascular Disease” (republished below) rebutting the “Cochrane Database of Systematic Reviews” which relies on so-called “Evidence Based Medicine” (EBM) to distort truth on Omega-3 essential fatty acids, the fact that Omega-3 fats are under such false attack represents a huge disservice to the public. While essential fatty acids may not generate profits for corporations—and in fact may lead to improved health outcomes that threaten the use of chemicals and drugs—essential fats nevertheless remain foundational for health. Above we have shown the important reasons Omega-3 fats and other essential fatty acids are scientifically termed “essential.” And why people continue taking essential fats, and giving them to their families and children, for supporting health and well-being. Primary among these reasons is that you cannot be healthy without them. Hence, they are essential. Why believe anyone who says otherwise? The bottom line: Omega-3 essential fatty acids are critical for health. Supplementing the diet with them is a good idea for nearly everyone. This is especially true because typical diets are proven to be most deficient in Omega-3 among essential fats. The Cochrane Database of Systematic Reviews has just updated its own review: Omega-3 fatty acids for the primary and secondary prevention of cardiovascular disease . Here’s our take on it. Michael Pollan, the brilliant food writer, reckoned you could sum up what to do about nutrition and diets in 7 words; “Eat food, not too much, mostly plants.” That sums up both what’s best for humans and what’s best for the planet. We reckon you can sum up what’s wrong with evidence-based medicine (EBM) in 10 words; “Evidence is a waste of data; systematic reviews are palimpsests.” You can use that as a knife to quickly dissect this study. There are many things wrong with this review. Somebody’s PR department has spun the review’s “no clear evidence of benefit” into “evidence of no benefit” – absence of evidence becoming evidence of absence. And clearly the media were entirely happy to take that one and run with it. What’s a palimpsest? Back when things got written on vellum, an animal skin, not on paper, you didn’t throw it away; you recycled it and wrote over the original. It was called a palimpsest. A systematic review gives an opportunity to write over the conclusions of a whole list of papers with your new version of the truth. You do that by the way that you select and exclude them. For instance there was a meta-analysis (that’s a systematic review with more numbers) in 2005 that concluded that vitamin E supplements significantly increased the risk of death . The way they did that was to rule out any study with less than 10 deaths – when fewer deaths was exactly the outcome they were supposed to be looking for. The reason they gave for doing that was “because we anticipated that many small trials did not collect mortality data.” We’re not buying it; they used it as a trick to enable them to get the negative result they wanted – to over-write the findings of a long list of original studies. And here we have authors doing the very same thing in this omega-3 study – and upping the ante slightly. Now the threshold is 50 deaths. Fewer than that and your study is ruled out of the final, supposedly least biased, analysis . . on the grounds that it’s more biased. We don’t know how they could keep a straight face while saying (our interpretation); “The studies with fewer deaths showed more benefit from omega-3s, so we excluded them.” At least that’s what happened back in 2004 when the first version of this came out. But this is the 8th update (we think) and they no longer bother to tell you about what they included or excluded in detail, so we can only assume that if they had changed that exclusion they would have told us. They found not one example of adequate blinding among 100 Cochrane reviews (like this one); they could all be palimpsests. Do we know that they are fake? No, but it doesn’t matter: what we do know is that we can’t trust them. Nor can we trust this Cochrane review. Things haven’t changed since 2004. Evidence is what lawyers and courts use to find someone Guilty or Not Guilty, and we all know how that can go wrong. It’s a binary system: you’re either one or the other. But at least if you’re on trial all the evidence should be about you and whether you did the crime. In EBM the evidence is all about populations, not about individuals. When a doctor tells you “There’s a 1 in 3 chance this treatment will work” he is required to base that on big studies, or even systematic reviews. You don’t, and you can’t, know what that means for you because very likely you don’t fit the population profile. As Steve Hickey (again) said, the statistical fallacy underlying all this states that you have one testicle and one ovary – because that’s the population average! The authors of this study update started off with about 2100 papers that looked relevant. They then excluded 90 per cent of them for various reasons – some of them good reasons, some not. A smarter way to work would be to data-mine them and look for useful information about sub-groups and sub-effects in all the papers. Is there a particular reason omega-3s might work for you and not for others? Perhaps you can’t stand fish, or are allergic to them, and so are deficient in omega-3s. But the review system doesn’t allow it, it insists on overall conclusions (about populations), and that’s a colossal waste of data. It also confounds the overall finding of the review – it biases it in fact. Here’s an example: while most subgroups that made it to the final analysis showed a small reduction in risk from taking omega-3s in one form or another (pills, food, whatever), those who got it from supplemented foods, which we understand means stuff like margarine with added omega-3, showed a 4.3-fold death risk increase! The problem here is that the effects of omega-3 fatty acids cannot be studied alone as if they were a drug. What counts are all the other components of the diet that affect a person’s health. Processed foods and drinks that contain many unhealthy ingredients can’t be made healthy by adding small doses of vitamins, minerals, and omega-3 fatty acids. In fact, many processed foods that contain small doses of vitamins and other essential nutrients are unhealthy because they contain large doses of sugar, salt, and harmful ingredients such as preservatives, dyes, and other non-food items. Part of the problem is that lipids are truly complicated, and not many people, patients, doctors or even scientists, understand them well. You need a good understanding of lipid metabolism to appreciate the difference in metabolism and impact between alpha-linolenic acid (ALA, in food such as oily fish) and extracted oils such as EPA and DHA that are only found at high levels in omega-3 supplements. At these levels they are effectively new to nature; nobody, indeed no mammal, was exposed to really high doses of DHA until we invented fish oil supplements . Miss that fact and you miss the difference between having people eat fresh oily fish or just using omega-3 margarine! We know from a variety of studies that a diet containing generous portions of green leafy and colorful vegetables and fruits, moderate portions of eggs, fish, and meat, and supplements of adequate doses of essential nutrients (vitamins and minerals) is effective at lowering the risk for cardiovascular disease. Adequate doses of both omega-3 (in flax oil, walnuts, fish) and omega-6 (in seed oils such as canola, soybean, peanut) fatty acids are essential for health. Although essential, omega-6 fatty acids are thought to contribute to inflammation throughout the body whereas omega-3 fatty acids are anti-inflammatory. Omega-3 fatty acids are essential for most body organs including the brain but are found in lower levels than omega-6 fatty acids in most vegetables. Risk for cardiovascular disease can be lowered by adequate doses of vitamins C (3,000-10,000mg/d), D (2,000-10,000 IU/d), E (400-1,200 IU/d), and magnesium (300-600 mg/d) in addition to an excellent diet that includes an adequate dose of omega-3 fatty acids. 2. Miller ER, Pastor-Barriuso R, Dalal D, et al., (2005) Review Meta-Analysis? : High-Dosage Vitamin E Supplementation May Increase. Annals of Internal Medicine, 142(1), pp.37-46. Available at: http://annals.org/article.aspx?articleid=718049. 4. Hickey S, Noriega LA. Implications and insights for human adaptive mechatronics from developments in algebraic probability theory, IEEE, UK Workshop on Human Adaptive Mechatronics (HAM), Staffs, 15-16 Jan 2009. The peer-reviewed Orthomolecular Medicine News Service is a non-profit and non-commercial informational resource. Comments and media contact: drsaul@doctoryourself.com OMNS welcomes but is unable to respond to individual reader emails. Reader comments become the property of OMNS and may or may not be used for publication. Dr. Andrew Saul, editor of the Orthomolecular News Service (OMNS), recently wrote a satirical commentary “How to Bash Vitamins with a Meta-Analysis.” This satire takes the form of a memorandum from the world headquarters of pharmaceutical politicians, educators, and reporters (WHOPPER). The specific vitamin-bashing meta-analysis which prompted Dr. Saul’s satire is titled “Supplemental Vitamins and Minerals for CVD Prevention and Treatment” and published in Journal of the American College of Cardiology. The meta-analysis finds nutritional supplements useless, or with negligible benefit, and even dangerous. These conclusions would be laughable except that it is presented to the public as based on sound science. It is not. Of note is the fact that the meta-analysis relies on studies using low-dose supplementation, as well as studies using synthetic forms of vitamins and not natural coenzyme forms. For example, folic acid instead of natural folates. Meta-analyses such as this one are tired, trite, and re-cycled every few years, as if somehow they are “news.” Moreover, the meta-analysis discloses significant conflicts of interest, which not only is disturbing, but also indicates a bias against supplements that makes its false conclusions even less trustworthy. TOP SECRET: Do Not Let This Get on the Internet! No Leaks! Distinguished members, our decades of disparaging nutritional therapy have paid off at last. The public, and their healthcare providers, are completely hoodwinked. By pushing “evidence based medicine” on the medical professions, we have elegantly slipped in our choice of evidence to base medicine on. And this is no mere journeyman accomplishment: this is high art. Mr. Machiavelli would be pleased. Certainly the pharmaceutical cartel is. We are well on our way to eliminating the competition, namely that increasingly irritating “orthomolecular medicine” faction. Here’s how we are winning the Vitamin War: It is entirely too obvious, from our reading the nutritional literature, that vitamins and minerals are a well-proven, safe and effective therapy. Of course, anyone knows that to work they must be employed in appropriate doses, just as any drug must be given in an appropriate dose. That is the problem, but it is also our opportunity. Since high nutrient doses work all too well, we eliminate all those embarrassing positive high-dose studies simply by ignoring them. By selecting, pooling and analyzing only unsuccessful low dose studies, our conclusions exactly fit what we want the public to believe. Using data only from poorly funded urban schools, we can prove mathematically, by statistical analysis of grade-point-averages, that inner-city kids have no academic future. By collecting data as to how many 19th century women graduated from college, we can show that women then were not as qualified to vote as men are today, and overturn the 19th amendment. If we assemble data on screen time and analyze actors’ roles from Hollywood movies made in the 1920s and 1930s, we can demonstrate that some races are best qualified to be domestic workers, tap dancers or to operate laundries. By giving a large sample of the homeless 25 cents each, we can show that higher personal income is ineffective against poverty. If we tabulate inventory at Ferrari dealerships exclusively, we can prove Hondas are scarce. Repeatedly taking the temperature of thousands of cadavers is justification that funeral homes do not need central heating, at least not at night. Here is unlimited opportunity for social engineering. It logically proceeds from our widely publicized analyses of vitamin supplementation, analyses that were (of course!) limited to studies that used low doses. Political mathematics is a wonderful thing: select your data and meta-analyze it into truth. Don’t worry: the public will accept it. After all, we just did a meta-analysis of the words of Abraham Lincoln. What he REALLY meant to say is that you can fool all of the people all of the time. We shall continue to act accordingly. The above satirical commentary is in reply to yet another vitamin-bashing report. This particular one is Supplemental vitamins and minerals for CVD prevention and treatment. J Amer Col Cardiology 2018, 71:22. The Orthomolecular Medicine News Service strongly disagrees with allegations that supplements are basically useless or even harmful. The financial interests of the study’s authors makes VERY interesting reading. To see this truly enormous list, you have to scroll way, way down at https://www.sciencedirect.com/science/article/pii/S0735109718345601 Interestingly, if you download the paper, you do not get the conflict of interest section with it. You have to see it online to get the whole story. How about that. Read abstract of the meta-analysis: “Supplemental Vitamins and Minerals for CVD Prevention and Treatment.” J Am Coll Cardiol. 2018 Jun 5;71(22):2570-2584. doi: 10.1016/j.jacc.2018.04.020. 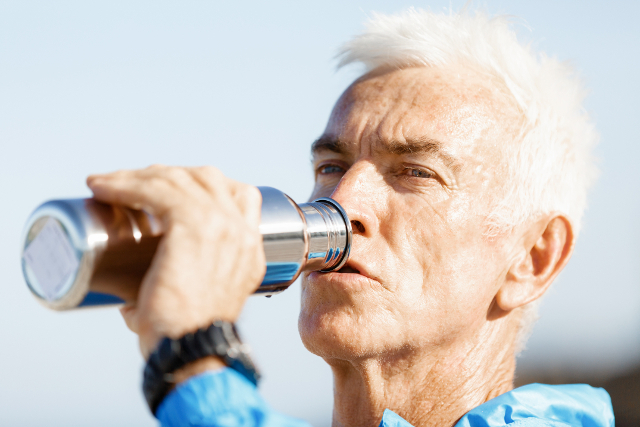 Supplemental hydrogen is fast becoming essential in many people’s nutritional supplement regimens. Why? Because hydrogen offers significant health benefits, including excellent antioxidant protection, increased energy, faster recovery, and improved well-being. Who doesn’t want those benefits? My favorite way to take hydrogen is to make hydrogen-infused water, or what I call a hydrogen “fizzy” drink. 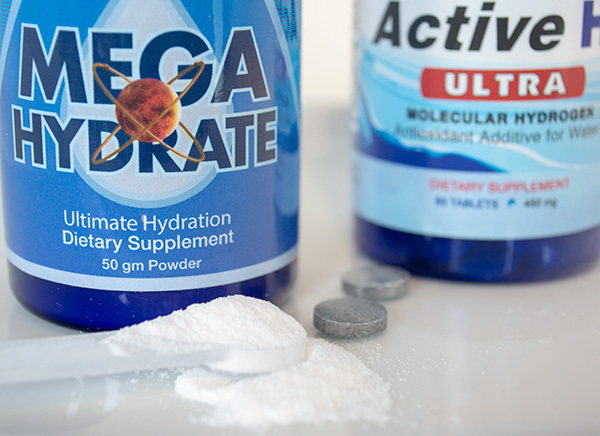 Two products I like best are Active H2 Ultra tablets and Megahydrate (available in powder and capsules). Active H2 Ultra provides molecular hydrogen (H2) and Megahydrate provides hydride (H-). Both are great standalone formulas, yet work well together as each provides unique means to quench free radicals effectively. Drinking H2-rich water is an easy and effective method for obtaining hydrogen, according to the Molecular Hydrogen Foundation. Making hydrogen-infused water is simple and convenient, as you can drink it at home or while traveling. 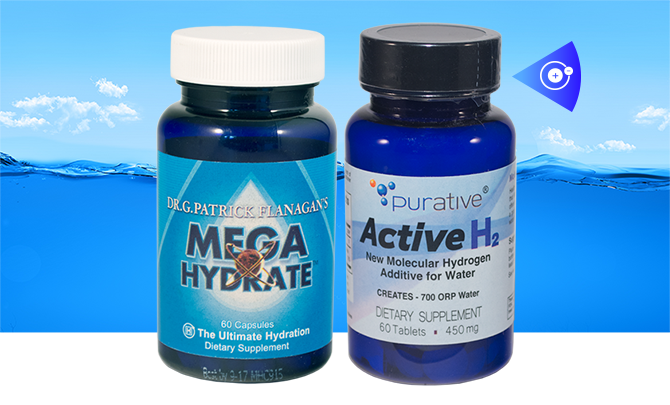 Effective hydrogen products HPDI carries include Active H2 Ultra tablets, Megahydrate powder, and Megahydrate capsules. My favorite hydrogen drink contains both Active H2 Ultra and Megahydrate. I take these products separately at times, but find it easier to take them together—and gain the benefits of both immediately. 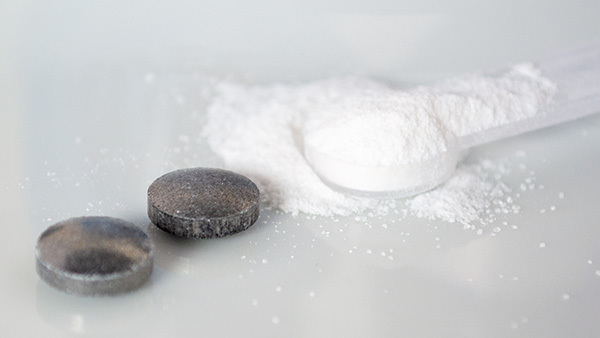 Active H2 Ultra tablets and Megahydrate powder work together for major antioxidant power. DIRECTIONS: Put one scoop of Megahydrate powder (or open one capsule) into your container of water. Let sit for about 30–60 seconds. Drop in one Active H2 Ultra tablet. Allow it to effervesce for one minute or until fully dissolved. Drink immediately. For best assimilation, preferably take on an empty stomach at least 10–15 minutes before food. Wait one hour after eating to drink hydrogen-infused water. Note: Do not wait long after effervesce stops to drink the water because hydrogen will escape into the air. Alternatively you can cap the container with a lid, and this will allow the hydrogen to last a while longer. Molecular hydrogen is sufficiently small to pass through glass, so use a metal container if you plan to cap it. If you drink immediately, then the type container you use won’t matter. I personally prefer a glass mason jar. This allows me to see the tablet dissolve, but also means drinking it immediately. I make 1–3 hydrogen fizzy drinks daily, first in the morning and then in the afternoon, but almost never in the evening as it can be energizing. I drink hydrogen water on an empty stomach. I gain a significant energy boost, but also other benefits, including improved athletic performance, faster recovery from exercise, and an overall greater sense of well-being. I highly recommend you try hydrogen supplements for yourself, and then consider them for your clients or patients. Our experience is that most people are pleasantly surprised by the results they get from hydrogen supplements, especially if they have a need for exceptional free-radical defense, or stand to benefit from the proven effects of hydrogen (see list below). You will want to continue taking hydrogen supplements regularly because the benefits are so significant, especially over time. Let the power of hydrogen starting working for you. 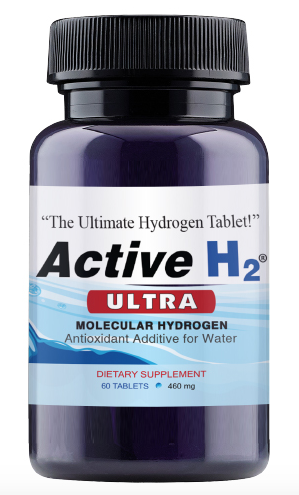 Active H2 Ultra is a fast-effervescing tablet. More than 1,000 scientific studies indicate molecular hydrogen offers therapeutic potential in 170 disease models, and every organ of the body, according to the Molecular Hydrogen Institute. Hydrogen is an antioxidant. It is also an extremely small molecule that can penetrate even the tiniest cellular compartments. This helps explain how hydrogen works to offer free-radical defense throughout the entire body. • H2 reduces oxidative stress as a selective antioxidant and by maintaining homeostatic levels of glutathione, superoxide dismutase, catalase, etc. • H2, like other gaseous signaling molecules (i.e. NO, CO, H2S), appears to have cell signal-modulating activity affording it with anti-inflammatory, anti-obesity, and anti-allergy benefits. We include hydrogen supplements in HPDI’s system of Foundational Supplements. In fact, hydrogen formulas as just one of six foundational supplements. We consider hydrogen a “secondary” foundational supplement usually to be added to a supplement regimen after the four primary ones: multivitamins, antioxidant & vitamin C formulas, essential fatty acids, and superfoods high in dietary nucleic acids (i.e., Rejuvenate! superfoods). 1. Molecular hydrogen easily diffuses into subcellular compartments where it scavenges cytotoxic oxygen radicals, thereby protecting DNA, RNA, and proteins against oxidative stress. 2. Molecular hydrogen triggers activation or upregulation of additional antioxidant enzymes (e.g., glutathione, superoxide dismutase, catalase, and others) and/or cytoprotective proteins of the body. 3. Molecular hydrogen may be a novel signaling molecule that alters cell signaling, cell metabolism, and gene expression. This may explain its apparent anti-inflammatory, anti-allergic, and anti-apoptotic (or anti-cell death) effects. Notably, two of these three mechanisms of action involve antioxidant activity. Hydrogen is one of the best antioxidants for all the reasons discussed, and we believe it acts synergistically with other antioxidants, including Vitamin C, glutathione, and Nrf2 activators (like those in HPDI’s Ultimate Protector). Why add Megahydrate to your hydrogen-infused water? Because Megahydrate provides hydride, the negative anion of hydrogen, or H-. Thus, a tiny scoop of Megahydrate provides vast quantities of electrons available to quench free radicals. Unlike molecular hydrogen, which dissipates quickly into the air, and therefore must be consumed immediately, hydride rich water (about -700 ORP!) may last for three weeks in an active state. That is a good reason to take Megahydrate by itself whether or not you already use it with molecular hydrogen in your hydrogen “fizzy” drink (see recipe above). Megahydrate (powder or capsule) provides hydride (H-) for free radical defense. The interesting thing about H- is that after it gives up its electron, it becomes simply “H” or atomic hydrogen. It then looks to pair up with another “H” to become H2, which is molecular hydrogen. In this way, Megahydrate not only gives you large quantities of stable H- and potent antioxidant capabilities, but also then creates molecular hydrogen in your body. This means it becomes a different kind of antioxidant, H2, which is therapeutic in itself. By adding Megahydrate to your hydrogen-infused water (as described above), you create a unique “double whammy” drink in which you maximize the powers of hydrogen (H2 and H-) to create and maintain good health. Note: Megahydrate powder is more cost effective than Megahydrate capsules, which must be opened into the fizzy drink. However, Megahydrate capsules are convenient for traveling and are easy to take by themselves. I keep both available, so I can use either one depending on my daily needs. Drinking H2-rich water is an easy, effective method for obtaining hydrogen according to the Molecular Hydrogen Foundation. Drinking hydrogen-infused water is convenient as you can drink it at home or while traveling. 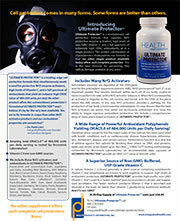 Effective hydrogen products HPDI carries include Active H2 Ultra tablets, Megahydrate capsules, and Megahydrate powder. As noted, I make 1–3 hydrogen drinks daily using Megahydrate and Active H2 Ultra. I drink them on an empty stomach. I enjoy a significant energy boost, which helps power me through my day. 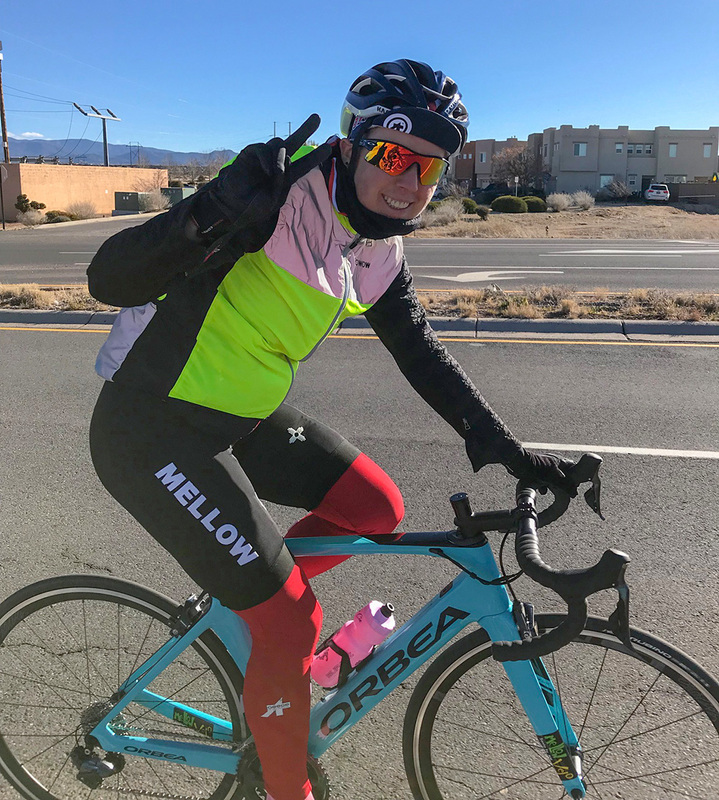 I gain other benefits, including improved athletic performance, noticeably faster recovery from exercise, and an overall greater sense of well-being. The nice thing about hydrogen supplements is how flexibly you can use them. While I typically prefer to make hydrogen-infused “fizzy” drinks in water, I will often sip Megahydrate-infused water by itself during the day or even in the evening (as it is less energizing than molecular hydrogen). 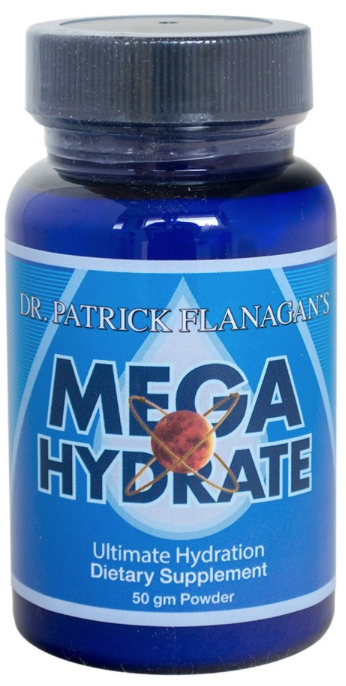 Megahydrate does not immediately lose its potency in water, so it can be casually sipped. Also, if you’re traveling or on-the-go, you can simply swallow a Megahydrate capsule by itself. Finally, you can carry Active H2 Ultra tablets with you wherever you go, and add them to water whenever convenient for you. Megahydrate and Active H2 Ultra creates an ultra-healthy hydrogen fizzy drink. Try hydrogen supplements for yourself. Then consider recommending them to client, patients, friends, and family. Most people welcome the results from hydrogen. This is especially true if they need exceptional free-radical defense — and who doesn’t? We can all stand to benefit from the proven health benefits hydrogen uniquely provides. After you try hydrogen, you will want to continue taking it. Hydrogen-infused “fizzy” water can become your go-to drink. Remember, hydrogen works best when taken consistently and daily! Heard of RESTORE liquid mineral supplement? If not, you’re about to discover something important for gut health. RESTORE™ is formulated to help restore gut health. It works by strengthening the integrity of tight junctions in your intestinal wall. Maintaining tight junctions is important because they protect your body from substances entering the blood stream. Restore also supports the communications systems of the bacteria in your microbiome. Tight junctions are natural barriers protecting the lining of your gut barrier, organs such as kidneys and heart, and the blood-brain barrier thereby keeping out unwanted substances. Even as we take in nutrients from the GI tract, the function of tight junctions is maintaining the integrity of the gut wall and other barriers that protect the body. These days, our gut membrane has a tough job keeping out unwanted substances. Because tight junctions are weakened by many things, including highly processed foods, especially those containing gluten and gliadin, the herbicide glyphosate (the primary ingredient in RoundUp weedkiller), and other exposures like electromagnetic fields (EMF) from digital devices and Wi-Fi networks. As a result of weakened tight junctions, undesirable substances from food proteins, harmful chemicals and other toxins can slip though into our bloodstream. This can lead to a powerful immune response that can weaken immunity and cause significant inflammation. Foreign substances in the bloodstream can also result in extreme food allergies and food sensitivities to various toxins entering the body. We live in an age in which our microbiome health is under assault. Studies show our ancient ancestors had 20,000–30,000 different strains of beneficial bacteria in their GI tracts. Many people today have just 5,000 or less. Why is that? There are many reasons for low microbiome diversity. These reasons include antiobiotic use (both from pharmaceuticals and foods), glyphosate (which essentially acts like an antibiotic), processed foods (especially those containing gluten and gliadin), and systemic degradation of the gut environment rendering it less hospitable for maintaining health populations of gut flora. These impacts are significant because diversity in your microbiome not only supports gut health, but also appropriate brain health, immune system health, and overall vitality. Restore acts as a “microbiome fertilizer” helping establish and maintain healthy microbiota. In fact, Restore contains important “redox” molecules produced millions of years ago by existing soil bacteria. These molecules are an important part of communications systems within the body between gut bacteria and with the body’s mitochondria. These communication systems play an important role in establishing proper homeostasis throughout the body. Other benefits include support for respiratory wellness, enhancing mental clarity, and promoting proper homeostasis throughout the body. For all these reasons and more, you should consider taking Restore. You can start by taking one teaspoon or less daily, and gradually increasing your dose to one tablespoon or more. I have taken Restore daily for more than two years, and benefit greatly from it. The most noticeable effects are a complete cessation of spring allergies (after two decades of worsening symptoms), greater clarity of thinking, and improved overall well being. I have seen other people get good results with a variety of conditions from dysbiosis to gluten/gliadin sensitivity. Restore is a dietary supplement supplying first line defense against daily exposure to environmental and food-borne factors. It helps create an optimal environment or ecology in the gut membrane for beneficial or “good” bacteria to flourish. Beneficial gut flora protect your immune system and maintain health. Restore is a scientifically proven soil-derived mineral supplement designed to support protection of the intestinal walls. Restore protects the entire gastrointestinal (GI) tract against agricultural herbicides, antibiotics, GMOs, gluten, and food-borne toxins. It helps create an environment in which 20,000–30,000 different strains of beneficial gut bacteria can thrive. This is a far different mode of action from probiotics, most of which contain just 3–30 strains of beneficial bacteria. Restore helps create a strong immune system along with proper gut function. Microbiome balance and tight junction integrity are known to constitute a significant part of the immune system. They directly affect DNA transcription of cells to promote optimal health and prevent a leaky gut syndrome, thereby improving gut intelligence. Seventy percent (70%) of our immune system is found in our gut. We need tens of thousands different strains of good gut bacteria to support a healthy immune system. Clinical experience, in addition to cell culture studies, support the theory that Restore’s proprietary formula creates the optimal environment in the gut to create a tight junction barrier and maintain our health and wellness. Restore is a daily liquid supplement designed to support the protection of the entire gastrointestinal (GI) tract against agricultural herbicides, antibiotics, GMOs, gluten and food-borne toxins by helping to create an environment where between 20,000-30,000 different strains of good gut bacteria thrive. Most probiotics on the market contain fewer than 24 different strains of good gut bacteria. 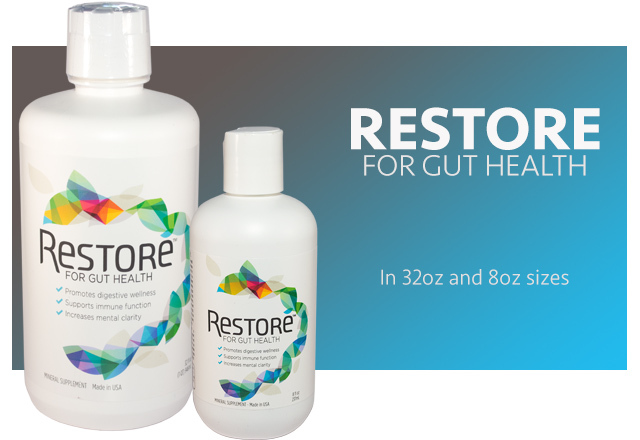 Restore is ideal for individuals suffering from gut health issues. Yet, it is also excellent for supporting and maintaining gut health generally. That is the reason we at HPDI consider Restore important enough to designate as a foundational supplement, one of the top six supplements you need for good health. Given the safety and effectiveness of Restore, there is broad applicability for its use. This is especially true because gut and microbiome health are under constant assault. These assaults range from multiple environmental and lifestyle factors—including poor diets high in processed foods, antibiotics in pharmaceuticals and animal foods—to massive glyphosate (herbicide) contamination of foods, soils, air, and water.